Black grape variety perhaps best known for providing typically 70% of the blend for the left bank wines of Bordeaux's Medoc, including the illustrious names of Lafite, Latour, Margaux and Mouton-Rothschild. 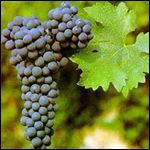 But this small berried, thick skinned variety is now an international player and proved itself to be extremely adaptable, whether vinified as a single variety, or blended. In Australia the wines of Coonawarra, grown on terra rossa soil are justifiably famous. In Italy it's a component of the Super Tuscan wines. In California they make some astonishingly expensive cult wines, and it is also blended to make the USA's answer to a Bordeaux blend, which the Americans call 'Meritage'. The South African's also produce Cape Bordeaux blends. On New Zealand's North Island some great Cab is produced in the Hawkes Bay area. In Spain it is a component of the legendary Vega Sicilia wines. And some lovely examples are also made in Chile and Argentina. Due to its high tannin content Cab has the ability to age for many years, and as it ages aromas of cedar, pencil shavings, cigar box and tobacco can develop, and may eventually evolve into game, leather and dark chocolate.